A homemade tomatillo sauce may seem overly complicated and time consuming but this sauce is neither. What it is though is dreamy and creamy without being overly rich. The most exotic ingredient, the tomatillos, are found at almost any grocery store and a quick zip in the blender makes the sauce come together quickly. The most time consuming part is waiting 20 minutes for the tomatillos to steam – just long enough to shred some chicken for the filling. 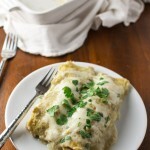 You could also make the sauce the previous day or in the morning, refrigerate it, and then warm it up when you are ready to assemble your enchiladas. Once the sauce is made, each tortilla gets a quick dip in the sauce before being filled and rolled. Dipping the tortillas in the warm sauce not only keeps the tortillas soft during baking but ensures that each bite is surrounded by creamy goodness. A nice sprinkle of cheese on top melts into a yummy gooey topping and keeps the creamy goodness going. For the sauce: Cut any large tomatillos in half and place all the tomatillos in a steamer. Steam for 15- 20 minutes until the tomatillos are soft and can easily be pierced with a fork. Place steamed tomatillos in a blender with the jalapeño, cilantro, garlic, milk, and salt. Puree until smooth. Heat oil in a large saucepan until very hot, carefully pour in the sauce (oil will bubble) and cook the sauce over high heat for about 5 minutes, whisking to blend, until sauce has thickened slightly. Whisk in sour cream. Let cool slightly. To assemble: Spread 1/4 cup sauce in bottom of a 11×7 inch baking dish. Warm tortillas in microwave for 60-90 seconds so they are soft enough to roll. Using your fingers, gently dip each tortilla briefly in the warm sauce, place on a plate, spoon shredded chicken and grated cheese down center of tortilla. Roll up the tortilla and place, seam side down, in the baking dish. Cover the tortillas with remaining sauce and top with remaining cheese. Bake at 400 degrees for 20-25 minutes until bubbly and cheese is lightly browned. I am not wild about sour cream but everyone else in my family is so I use 1/4 cup of sour cream. The sauce will still be creamy without tasting too much of sour cream. If you are a sour cream lover, use the full 1/2 cup for a creamier sauce. After steaming the tomatillos, I wipe out the saucepan and use it to cook the sauce – saves me from having to wash one more thing (which is huge in my book).